This is nothing magic but worth a mention. Being fundamentally lazy I don’t like to assemble and solder electronic multi-way connectors. There is never enough room to work on the contacts and the cables never lay up how you would like them to. This could have course be a function of my eyesight .. 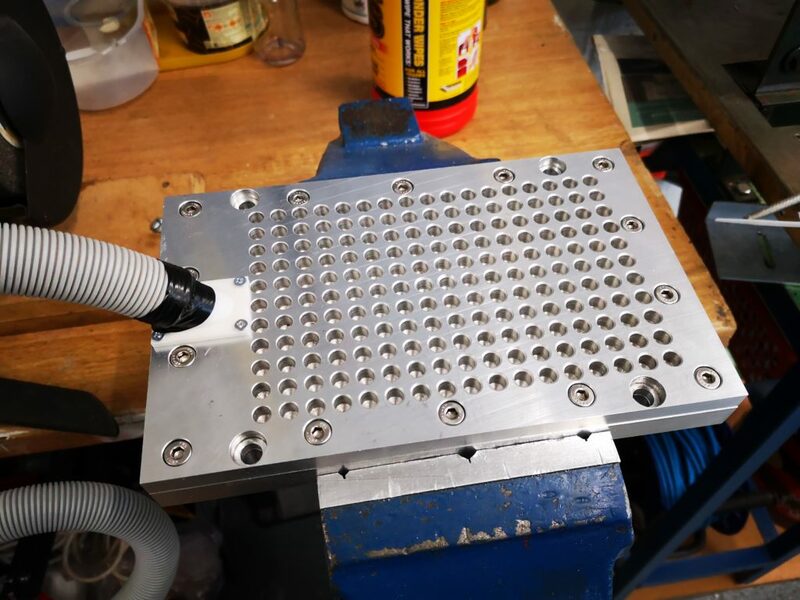 I am currently working on boxing and installing the Tormach USB Expansion Board which has a USB connector interface. 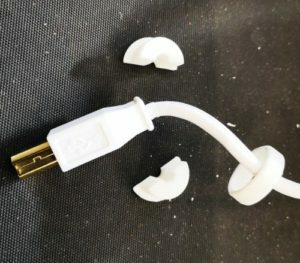 I wanted the cable to pass through some form of gland into the box but didn’t want to cut a standard USB cable and remake the connector at one end of the other. After some head scratching I came up with the following simple cable gland/cable grip. It is nothing revolutionary but made life easy and the parts only took 20 minutes to design in Fusion 360 and then 3D print on the Sindoh 3DWOX. 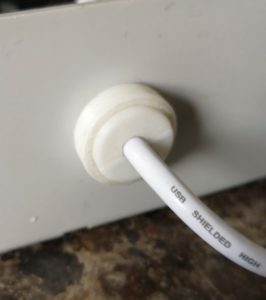 It has two identical semicircular halves that hold the cable and there is a ring that pushes over these on the outside of the box. 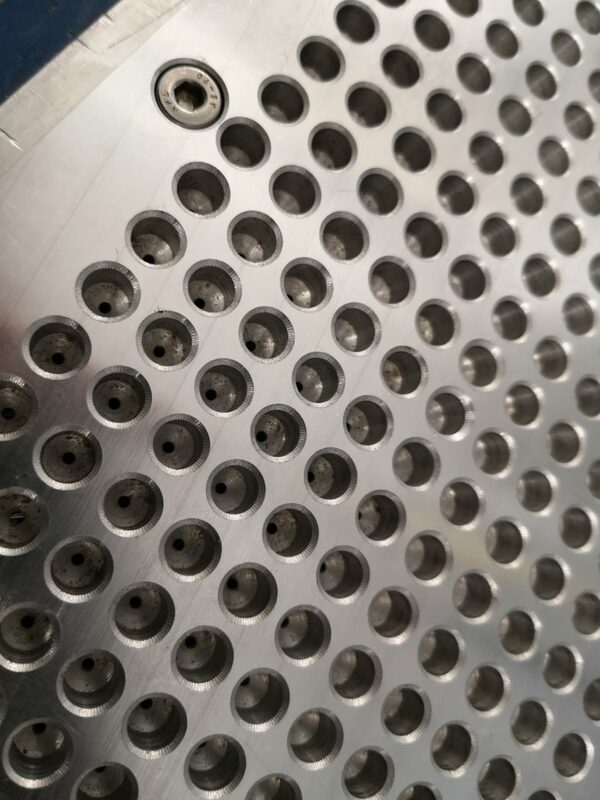 A small flange holds these in place on the inside of the box. 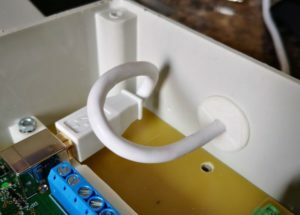 The hole in the box and the ring inside diameter are both 16mm to allow the USB connector largest dimension to pass through. 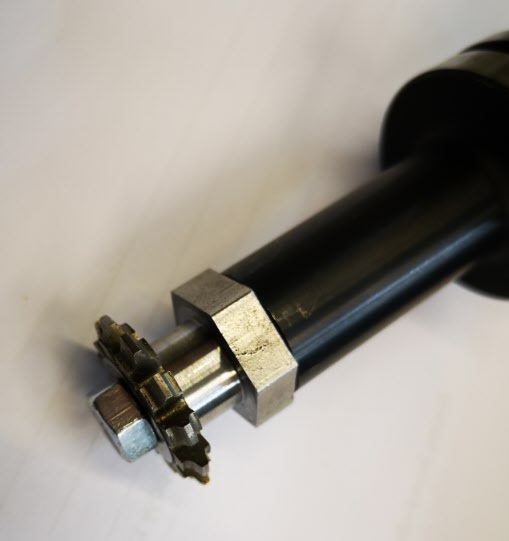 This is also one of the standard cut rings on a cone cut hole drill which makes cutting the hole in the box very straightforward. This has nothing to do with model engineering but thought you might find it amusing/interesting. Following my wife having spotted some low cost tickets to Toulouse from London Gatwick, we decided to make a quick trip to France to check out that all at our house was OK. The flight bookings were with a well known budget airline that has orange corporate colours. We checked in OK and the flight pulled away from the stand dead on time but 5 minutes later we were back where we started from. As the Captain said ‘one of his shortest flights’. Apparently a critical sensor in the port engine had gone AWOL. Technicians were called and we sat for 2 hours on the plane while they analysed and fixed the problem. Off we went once again but having missed our takeoff slot we were now at the back of the taxi queue. Finally we were sat at the end of the runway and the brakes were released …. only for pandemonium to break out in the cabin. The crew started rushing round and shouting to stay in our seats. The take off was aborted and we sat mid runway. Within minutes the plane was surrounded by all manner of fire appliances. Apparently a passenger’s lithium power tank had burst into flames. I guess his or her laptop or phone’s battery had died while we were waiting for the sensor to be fixed and while topping up from the power tank the charging current surge had upset things. The crew had been quick to put the offending article in a fire proof box. After blocking the runway for 6 minutes, we were escorted off the runway by the fire crew vehicles to a quiet area of the airfield. A team of fireman boarded the plane and took away the offending article. While 6 minutes does not seem long there would have been a lot of landings and takeoffs blocked. Had we been airborne when the smoke appeared we could have been sliding down escape slides and the weather outside would not have made that much fun. Because there had been an incident the airline procedure required that the crew had to be changed so they could be debriefed. We were therefore now faced the delay while a new crew was found. Further to this an offer was made that anyone wanting to leave the flight could do so (they didn’t ask for ‘any passengers of a nervous or superstitious disposition’). A number of passengers decided this was the best option. This meant a baggage crew had to be found to find their bags in the hold. So we had a baggage crew and a flight crew to wait for. When the new crew arrived they had to search the cabin to match bags to passengers to ensure nothing owned by the departing passengers had been left behind (suspicious or otherwise). After a total delay of 5 hours (still sitting in our allocated seats), we finally got airborne for Toulouse. I won’t extend your boredom by telling you about the hire car shambles on our arrival. We think we might think twice about flying to Toulouse another time but I have to say all credit to the flight crew, the technicians and the fire services for their swift and professional actions. Postscript : – better to travel hopefully ….. we then had a 3 hour delay on the way home. Weather at Gatwick delayed the flight out to Toulouse. Think we will stick to the ferry next time. 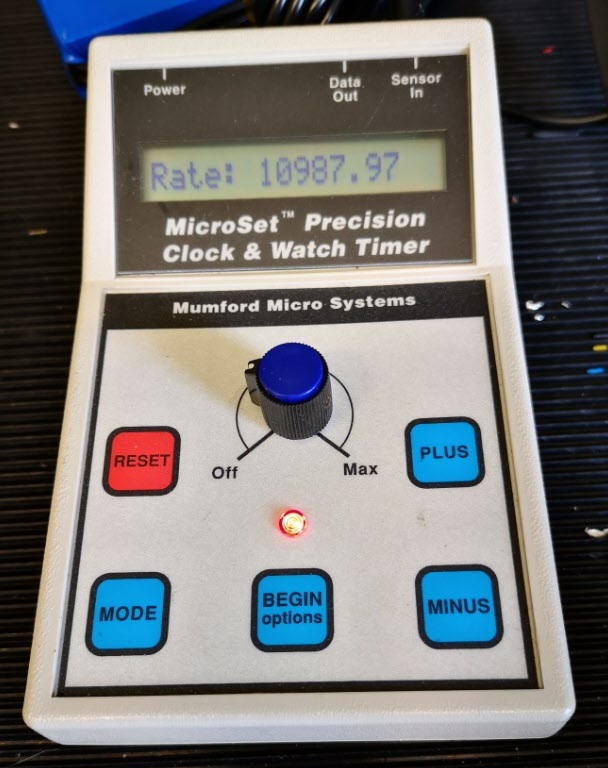 Some while ago I bought a Microset Timer from Bryan Mumford. This is a lovely device that allows you to monitor all manner of parameters on clocks and watches. 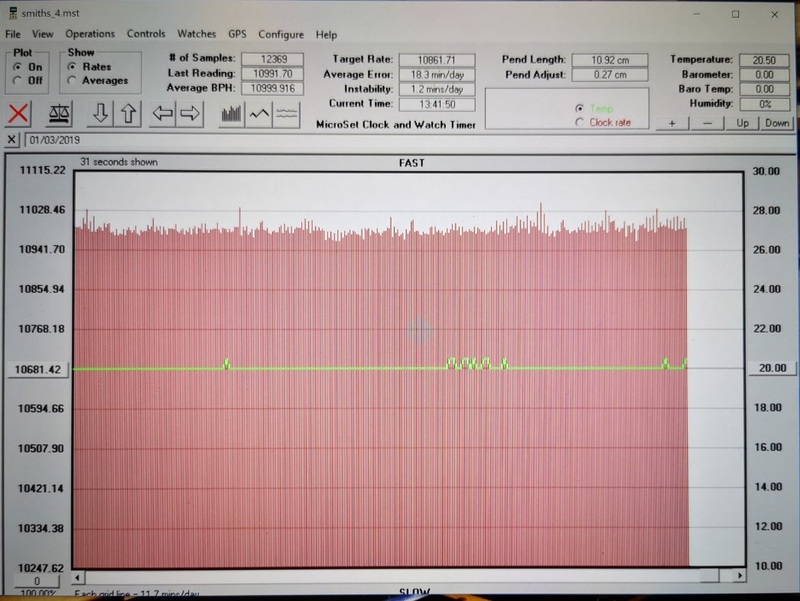 It has an acoustic sensor to listen to the beat of the clock or watch and an optical sensor that creates and detects a beam of light that is chopped by the pendulum. From these simple accessories all manner of diagnostics can be done on the clock under inspection. If you want to know more I suggest you log into Bryan’s site. Bryan also has some videos which you can find on YouTube. You might also want to download and read a pdf collection of articles written by Chris McKay in the Horological Journal about using the Microset to fault find on Turret Clocks. If you are a regular reader of this blog you will know that I have got involved with the local church clock which is a Cooke of York movement. I have been working with a fellow engineer in the village to try to bring the clock to time and we are slowly getting there. Our last major breakthrough was finding the fly was lose on the gravity escapement arbor. Since tightening the fly the clock has been much more reliable. There is a weight tray on the pendulum which has an assortment of coins in it where someone historically has been fine tuning the pendulum swing. Because the clock has been running fast by a few seconds per day we have been slowly removing the coins one by one to bring it closer to time. I think it is now at a point where we need to monitor it long term with the Microset. Bryan offers an upgrade to the Microset that allows a temperature sensor to be added to the recorded information. There will almost certainly be temperature changes in the clock tower so it seemed like a good idea to upgrade with the temperature option. This was ordered and duly arrived from Bryan and is now fitted. There is also an upgrade to allow the Microset to record data into internal storage in the Microset rather than depending on having a PC connected. I would be more comfortable leaving just the Microset in the church pendulum cupboard rather than my portable PC so I also ordered this upgrade. It took me about an hour to do both upgrades on the Microset. The memory upgrade involves a chip change inside the device and the temperature monitor needs an additional 3.5mm jack socket fitting and wiring to accept the new temperature sensor. Neither is a difficult task but clearly need to be done carefully so as not to do any damage to the Microset. Bryan’s instructions are well written and illustrated. 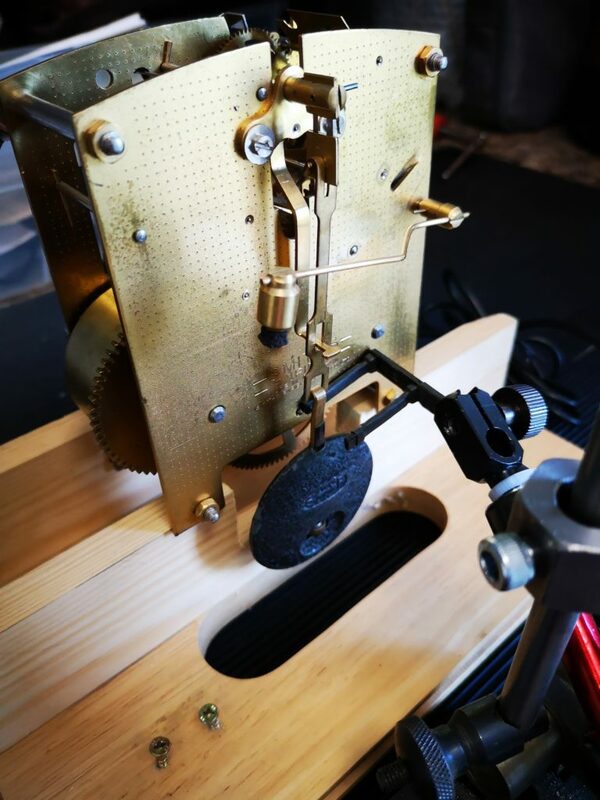 Since the upgrade I have been running the Microset on the bench with a Smith’s clock movement. (It is actually the one I stripped down, cleaned and rebuilt on my ‘Clocks 1’ course at the BHI). The new Microset facilities seem to work well and as expected. To implement measurements on the church clock the supplied optical sensor as shown in the picture above is not totally ideal. It has a very narrow gap between the transmit light source and the receiver detector diode which on a turret clock is not easy to use. 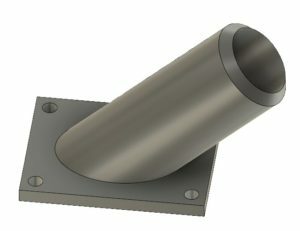 It is possible to get round this my fitting a cocktail stick or similar to the pendulum bob and using this to break the beam but it is a bit messy. I had picked up a bag of laser diodes and detectors at a local ‘ham’ radio junk sale and I decided these might form the basis of a new sensor which might be more useful to a large pendulum assembly. Bryan is a really helpful guy and although he does offer a larger laser sensor he was more than happy to help me with the required electronic interface to the Microset. The one proviso is that the amount of current drained from the Microset 5V power supply must be kept below 30mA. I set to and made the most elegant and over engineered solution for my laser sensor. This is shown below. The black mountings were designed in Fusion 360 and 3D printed on the Sindoh 3DWOX. The spacing between the emitter and detector is adjustable by sliding the transmitter along the steel rods. The power to the laser is also carried down the steel rods. A small DTC transistor provides the interface to the Microset and the 5V supply provided by the Microset is dropped via two diodes to power the laser. It works really well ….. but … when I went round to the church to install it I realised I should have checked one or two things first. 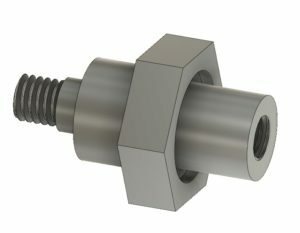 The rating nut at the bottom end of the pendulum (used to make course adjustments to the pendulum length) was almost touching the floor of the pendulum cupboard. My wonderfully elegant laser detector would not fit under the pendulum to monitor the swing. A serious re-think was needed. The gap was so narrow that at best I will only be able to get a piece of 16 SWG aluminium sheet or PCB underneath the rating nut. I did say I had a bag of laser diodes and detectors so a new version would be possible and I could then save the posh one for more public facing activity. As mentioned above I decided to use PCB as the base board. This is shown below. This has the advantage that I can use the copper surface to mill tracking into it to aid the wiring. The downside is that it is quite flexible and therefore possibly not stable enough to keep the laser aligned with the detector diode. To resolve this I soldered strips of nickel silver (could have been more PCB) either side of the centre line as shown but leaving a gap for the pendulum swing. 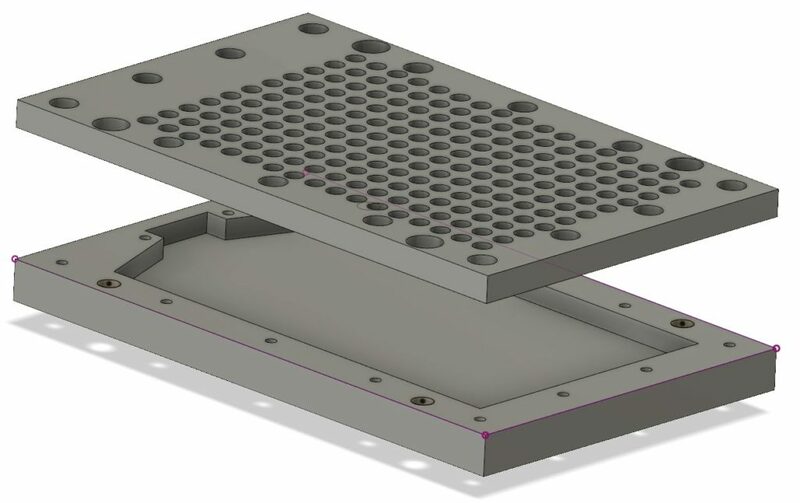 I designed a common holder for the laser and detector diode in Fusion 360 and 3D printed two of these on the Sindoh 3DWOX. The finished detector assembly still had a tendency to flex so I stuck some old pieces of credit card on the lower surface, one at each end before the mount and a large piece in the middle. This seemed to cure the problem without adding significantly to the base thickness. When plugged into the Microset all seemed to work well. Here is a typical PC display of the Microset data. I now need to get it installed in the church tower.